The conquering army's post-battle nourishment included Scotch & Coca-Cola cocktails and cheeseburgers. Their spoils included boxes of records including R&B 45s and a new album by a scruffy folk singer from Minnesota. 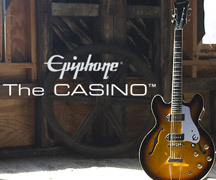 And in a few months time, those records would inspire The Beatles--and virtually every band in what became known as the "British Invasion"--to pick up the Epiphone Casino. Though Spector said little during the flight, he was enthralled by The Beatles, who managed to create their own wall of sound with just bass, drums, and two guitars. Spector, perhaps more than anyone else in America, knew these odd looking fellows were the future of pop music and his sense of competition must have been even greater than his fear of flying for him to make the trip. While Spector and The Beatles were on their way over the Atlantic, hundreds of kids--encouraged by local pop radio djs--had cut school and were waiting for The Beatles' plane to arrive at newly renamed John F. Kennedy airport in Queens. All three tv networks sent reporters to cover the arrival, most of them hard news veterans who had no idea why they should bother. Just who--or what--these guys were was a bit of a mystery to everyone who watched the London flight land on that Friday afternoon. Just what on Earth was a rock and roll band, any way? 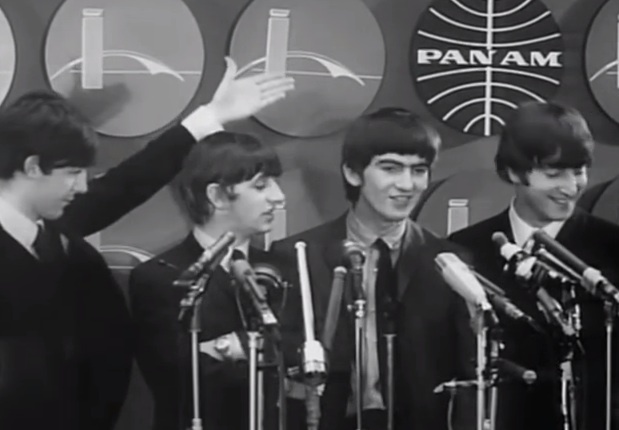 At the press conference held in the Pan-Am lounge, The Beatles threw off well-rehearsed verbal missiles that let the gathered throng of cigarette crunching newsmen know these lads were a bit unusual and perhaps newsworthy after all. Dressed in fine British suits, The Beatles also had matching haircuts they described as Arthur. All four seemed to emit a strange air of insouciance usually associated with the likes of the Royal husband, Prince Phillip. In fact, The Beatles seemed amused at America, as if it were still a colony, and a clueless one at that. "No," said 24 year-old John Lennon who was immediately pegged as the band's leader. "We need money first!" he retorted, adjusting his cufflinks. This went on for quite awhile as the boys made light of Beethoven ("I love his poems," said the drummer, Ringo Starr) and remarked if they knew why they were popular they would retire and instead, "form their own group and become managers." But the real popularity war was won a few nights later when the quartet performed on the highly rated Ed Sullivan Show, the Sunday night variety program hosted by longtime CBS host Ed Sullivan, the same program that had broadcast Elvis Presley into America's living rooms in 1956. These longhairs were getting the same reaction Elvis did, except now those kids were teenagers with a completely different level of fervor. That night, The Beatles quickly demonstrated the loud, stage-splintering live act they had become after years of non-stop performances in brothels, basements, clubs, theaters, BBC radio shows, rehearsals, and recording sessions. After turning on England, Scotland, Germany, Ireland, France, and Sweden, America was the last --and crucial--domino to fall in their quest to become "bigger than Elvis," as Brian Epstein predicted they would one day become. After February 1964, The Beatles never looked back. In fact, they couldn't because John, Paul, George, and Ringo were too busy running for their lives. And they would keep on running forever more. CBS television would later claim 45% of American homes with televisions tuned in to Sullivan's enthusiastic presentation of "the boys from Liverpool," and it's no exaggeration that American pop culture was completely stunned by the sight and sound of the quartet. Their performance even brought down the national crime rate during the broadcast. 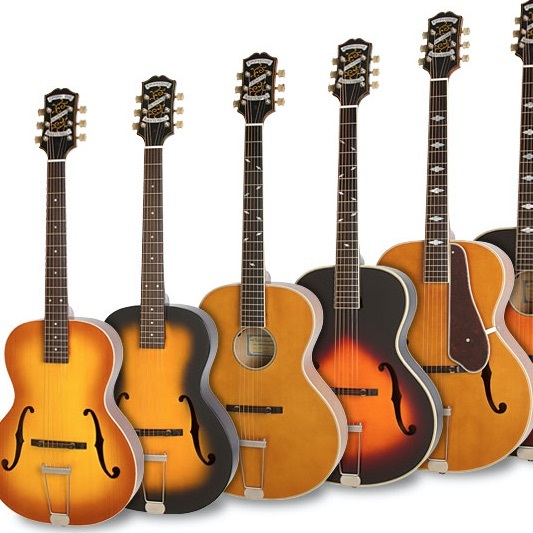 And young musicians all over America—including Bob Dylan, Sam Cooke, a young Roger McGuinn, and an even younger Tom Petty--noted that something new and special had just happened to popular music. For New York-based songwriters like Carole King and Neil Sedaka who made their living writing for other artists, the arrival of The Beatles meant their jobs were suddenly in danger. These guys with the matching suits not only played their own instruments, they wrote their own songs, too. True, "Will You Still Love Me Tomorrow" was a better lyric than "I Want To Hold Your Hand," but it was no match for three part harmony, Duane Eddy guitar lines, and slashing drums. So what if Frank Sinatra and Quincy Jones hated them. Like them, hate them, or fear them--The Beatles were now all anyone wanted to talk about. 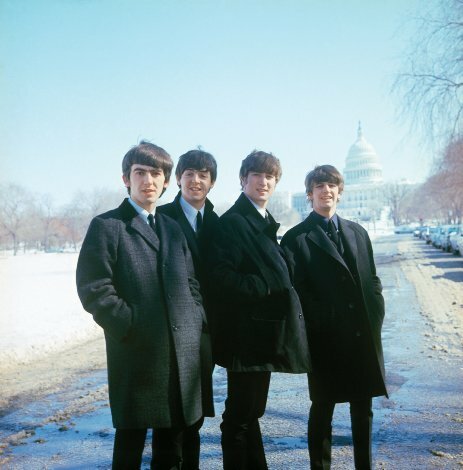 A few days later, the 'fab four' as the press now called them took the train south to Washington D.C. where they played their first U.S. concert, a marvel of rock mayhem complete with classic Spinal Tap-esque moments including bad mics, blown-out amps, a dodgy PA system, and a drum platform turned backwards. It's one of the most exciting concerts on film and as close as we'll ever get to seeing and hearing the fellows as they sounded in Hamburg or Liverpool where they honed their craft working nine hour shifts, hopped up on Preludin and lots and lots of beer. Ron Howard's 2016 documentary Eight Days A Week is a thoughtful (if G-rated) chronicle of The Beatles' touring years, but the original un-colored black & white concert film is best seen on its own to get the real picture. The Beatles were more than Elvis x 4. Elvis Presley, for all his gifts and uncanny knack for connecting with an audience, was musically sophisticated but stuggled with the isolation that barbed his route to fame and fortune. When The Beatles arrived in New York, they were cocky, street tough musicians who had raised themselves up as a tight-knit family. Elvis got his start playing high school gyms and country & western package shows. The Beatles honed their craft playing bars and theaters night after night. By the time they arrived in America, they had been working without a day off for almost four straight years. Even though Ringo joined the band in 1962, he was often on a similar schedule prior to joining. Elvis and The Beatles did share an appetite for a wide range of music and should have been fast friends. But even the King of Rock 'n' Roll couldn't help but feel marginalized by the arrival of these British punks. John, Paul, and George had been playing rock and roll together since the mid 50s and one could make the argument that they were more like trans-Atlantic colleagues of Elvis, Little Richard, and Jerry Lee Lewis than Rock's next generation. Mixing both British and American pop music, The Beatles produced a slow-cooked version of the original heady mix that made Rock 'n' Roll so irresistible in the first place. Now that they were finally in America (and the first British band to make it on the charts in a big way), these lads hold on the public's imagination was instant and magnetic. Their Ed Sullivan performance was a hard counter punch to the plaid world of AM radio and nothing would ever be the same after that Sunday broadcast. With the exception of Motown, Vee Jay in Chicago, and Sam Cooke's SAR records--all African-American owned labels--there was virtually nothing close to Rock 'n' Roll in the U.S. in February 1964. The impression they made still casts a shadow today. Many of you are reading this on a computer, tablet, or phone named after The Beatles’ record company. Behind the scenes, few "popular" acts in America--with a few notable exceptions like Sam Cooke, James Brown and Ray Charles--were so dedicated to their craft. The Beatles wrote and recorded constantly and were discerning critics of everything going on around them. As songwriters, John Lennon and Paul McCartney were also keen fans of a wide range of artists from Bing Crosby to the Coasters and were sly and expert thieves ("knicking" as McCartney called it) of chord structures and harmonies, often turning old ideas into new and beguiling melodies. The mainstream press in New York had never seen young, independent entertainers quite like this quartet, who traveled seemingly with no one but their manager, who opted to stay in the background as much as possible. Between Ringo's malaprops and John's Joyce-meets-Goon Show word play, they were too quick for the aged, stuffy press corp that huffed and puffed behind them and could do little but set themselves up to be knocked down with silly questions. 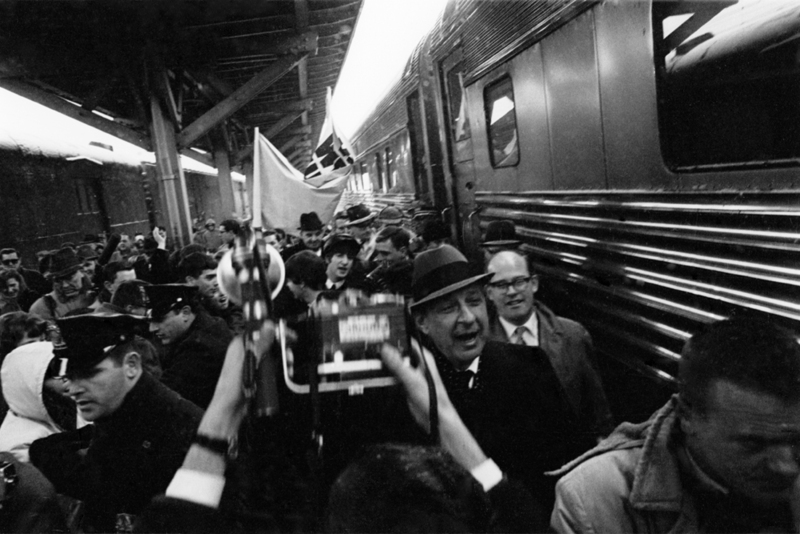 If you've ever wondered what all the fuss was about or doubted it was that big a deal, Albert and David Maysles film The Beatles: The First U.S. Visit (originally shown as What's Happening! The Beatles In the USA) is a fantastic introduction to western culture, 1964. As for The Beatles themselves, by early 1964 they had pretty much everything they needed. Except perhaps for a guitar that had some bite to it and by the end of the year, Paul would take care of that and buy his Casino which, in 2019, is still carrying on the revolution.